Egypt pays more for wheat – but will the price rises last? Egypt, the world’s top wheat importer, paid more for wheat at its second tender of the season – defying discounting by many merchants which appeared to underline a shift eastwards in the focus of export competition. Gasc, the Egyptian grain authority, over the weekend bought 300,000 tonnes of Romanian and Russian wheat at tender, adding to the Black Sea supplies ordered on Tuesday to take total purchases for 2016-17 to 480,000 tonnes. The purchase price of the wheat bought at the weekend, at $174.99 (A$233) a tonne including shipping ($167.13 a tonne excluding shipping), was nearly $2 a tonne above the price Gasc paid on Tuesday. “Operators have noticed that prices were up compared to previous tender,” said Agritel, the Paris-based consultancy.19 July 2016. Competition has been enhanced by weakness in freight rates, which has made it cheaper for importers to source supplies from distant and unusual origins, enhancing competition in agricultural commodity markets. Talking of sales to Asia’s Asean trade bloc, historically a big customer for Australian wheat exporters, the bureau said that “as international freight costs are now very low, Australia’s traditional freight advantage into this market has been eroded. Again, the bureau stressed the enhanced competitiveness of Black Sea exporters, such as Russia and Ukraine, saying that “the freight cost from Odessa to Indonesia is now reportedly cheaper than from some Australian ports to the same destination. The comments follow the announcement by Singapore-based Interflour last month, at the Agrimoney Investment Forum, that it was investigating sourcing more wheat from the Black Sea, and Argentina, because of the cheapness of their supplies compared with Australia’s. “Wheat from Russia and Ukraine is of lower quality than Australian wheat, but not $40 a tonne lower,” Greg Harvey, Interflour’s Australian-born chief executive, said. Meanwhile, grain merchant Nidera Australia separately on Wednesday said that “we continue to battle a tough market here in Australia. Nidera Australia added that “every grain growing nation in the world is experiencing fantastic conditions and rain continues to hit the paddock here in Australia. “The bottom line is there is going to be a heck of a lot of grain around within the next few months. The view of Ukraine Agro Consult. South and Southeast Asian market is the most attractive for exporters. Wheat imports to this region are estimated at level, which is comparable to imports by African countries and exceeds considerably the needs of EU and Middle East. For Ukraine the importance to build its business in Asian market can hardly be overestimated. This is no secret that Ukrainian wheat is in great demand in the world market. In the 2014/15 season exports reached 10.9 MMT, which is the highest level over the last 6 seasons. Egypt and Spain became the largest importers, as representatives of traditional market outlets for Ukraine – North Africa and Europe. The General Election is over thank goodness, anyone who didn’t get bored enjoys watching flies crawling over a window. We got the usual promises from the usual people. To think we have to go through the whole thing again in 3 years is unimaginable. It was a boring campaign, which was twice as long as necessary. The Prime Minister, Mr Turnbull, kept on saying ‘there has never been a more exciting time to be an Australian.’ The more he said the more his popularity went down. As the polls got closer and Election Day approached, the more the leaders increased their rhetoric. The man who wanted to become Prime Minister, Mr Bill Shorten, sank about as low as one can go in politics. He finished his campaign with, ‘You can have Medicare – or you can have Turnbull — but you can’t have both’. The pollsters say his despicable scare campaign worked, so some poor souls believed the lie. Is this kind of political lie, this garbage, now part of what is accepted in Australia? Is this how low our collective, our national standards have fallen? Spreading alarm and despondency is a crime under British Military Law, so I presume the same goes for Australia. The punishment is anything from a few weeks to life. Maybe it should also apply to politicians? Out of a list of 30 occupations, State politicians and Federal politicians came 23 and 25 respectively, with Union Leaders being 24. Says it all doesn’t it? Meat in the sandwich? Meat? well something anyway!! We elected people to govern us in whom we have little trust, it doesn’t make sense especially when you have have a look at the professions of those who came below the Parliamentarians! Once upon a time, Mary had a little lamb. A few days ago a colleague in the WA Department of Agriculture confirmed that the flock in WA continues to decline at around 13 million. We are still selling more sheep than the ewe flock is producing. Nationally the trend is the same. A decade ago I wrote somewhere, I can’t remember where, that if the then decline in sheep numbers continued, merino wool would finish up being a cottage industry. I got little support at the time — some would have had me in the mulesing cradle. The exception came from an unexpected quarter, the then State Minister for Ag who said it would be a great shame if I were right, adding that the evidence was on my side. I remember the post WWII great woolen mills of England. I remember when all of our clothing was made from either cotton or wool or a blend. I remember Nylon arriving on the market after WWII and being told that NYLON was an acronym for Nuts You Lousy Old Japanese. Maybe Japan was producing synthetic textiles by then? Maybe it was revenge for the Japanese silk, the finest of fabrics used for ladies stockings. Very soon ladies stockings became known as ‘Nylons’. The ICI British industrial giant built a plastics and textile factory British Celanese close to where we lived. It was the foulest stinking of factories and employed hundred of people and the yarn in turn was turned into a hundred and one fabrics. We wore Celanese ‘drip dry’ shirts, a boon to a mother with four boys. But they went yellow before the next one down the ‘hand me down line’ got them. Why did wool lose its preeminent place in the world as the finest of all textiles? Why after the Korean War when the USA realised what a valuable fabric wool was did Australia fail to reach trade agreements with them? The answers lie in Charles Massy’s astounding book ‘Breaking the Sheep’s Back’. The conclusion I came to after reading Charles’s book was that in the late 50s and 60s, pig-headed farmers and many so-called the finest and ablest leaders of the Australian merino wool industry planted the seeds of where the merino wool industry is today, which is probably terminal. We still have more committees and so-called Peak Bodies than one can poke a stick at yet agriculture’s terms of trade continues to decline. There is no debate that merino wool produces the finest clothing fabrics known to man and those fabrics can be worn in every climate. Why then is the merino wool industry controlled by China? Why, now that we are back to merino wool production levels not seen since the 1920s are we so indolent, lazy, couldn’t care less, stupid call it what you will that the greatest birth right our forefathers could have given us, something no-one else has, the Australian merino sheep, is now controlled by a country who really couldn’t care less about it. Australian merino wool to the Chinese is just another commodity. Napoleon called the British a nation of shop keepers. Had he known Australia he might well have called us a nation of miners. We are not very good at value adding to what we produce. Maybe it’s beneath us? 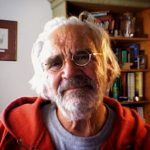 If we are to forge a new future for ourselves, a technical and innovative future it’s time we stopped being miners of everything from wool to iron ore and decided to test ourselves instead of always taking the easy way out virtually dig it up and ship it out. 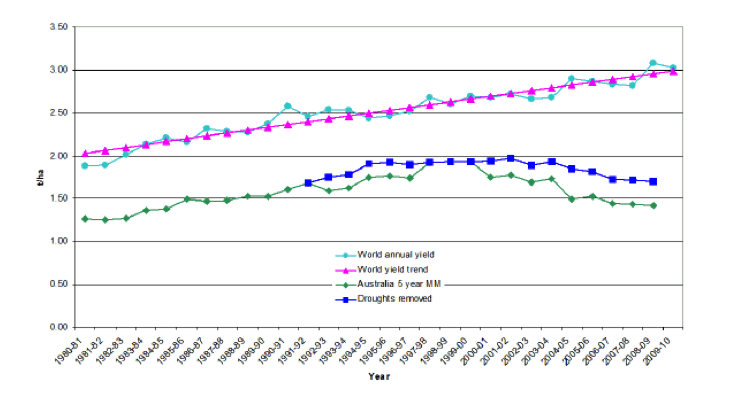 The chart demonstrates the decline in merino production over the last 25 years. The data is for full years to June 30, 2015. This chart is only updated once per year in July. What will replace sheep if grain yields continue to decline? Isn’t it time that Australian investment took over the Australian merino wool processing industry? If the Prime Minister is right and I agree, we have the talent and expertise in Australia to do anything, why can’t we take to take the world’s premium clothing fibre, which we own, which is our inheritance, on the journey from the sheep’s back to a finished high quality and unique product? Why should China monopolise yet another market? It has nothing to do with my heritage that I am wearing a wool pullover that came from Britain by mail and arrived less than seven days after ordering. It has a label proudly stating that it is made from 100% British Wool. ( I have found the prickle factor is low, but not next to skin low. Australian scientists invented the process that reduces the prickle factor. The pullover is machine washable. Another process invented in Australia. Why did my wife buy a pullover for me which, was made in not the UK you may notice but Britain? (1) Price — about half of what one would pay in Australia for a similar article and these days the pennies matter like never before. (2) Design — The design is simple and traditional and I like the leather elbows and shoulder patches, the size of the article is consistent with the label claim, which is refreshing. (3) Colour — muted brownish and green tweedy. I have a dark blue heavyweight cardigan from the same manufacturer. A few years ago while visiting one of the four knitting mills left in Australia, this one in Tasmania, we were told that the only place that shrink proof and non-prickle yarns were available at that time, was from China. A family factory, started by the lady of the house many years ago, her husband joined her when he gave up sheep farming. The husband told the story of buying superfine wool from his brother and before the bales went to China for processing he took samples and established the DNA of his consignment. When the wool was returned, shrink and prickle proofed and ready for knitting, further tests revealed that the wool they got back from China was not the wool they had sent, the DNA samples did not match. The fibre diameter did, but not the DNA. I am extremely pessimistic for the Australian merino wool industry. Why? Because I have just finished reading an article in ‘Moffits Farm’. Apparently the worldwide demand for unmulesed wool is rapidly increasing. Manufactures of quality fabrics are progressively looking toward South Africa, New Zealand and Argentina for wool from sheep, which have not been mulesed. It looks like there is a heavy dose of Australian arrogance when it comes to this question of mulesing. Like it or not the the people who turn merino wool into fine clothing ever increasingly want unmulesed wool. Are we going to respond by changing or are we going to see the merino disappear from Australia— let those to whom we have sold our best merino genetics be the ones who benefit from the generations of work our forefathers put into producing the finest wool apparel sheep in the world. Previous PostNational Bank Bastardry. Part IV. Summing up a Tawdry Affair. 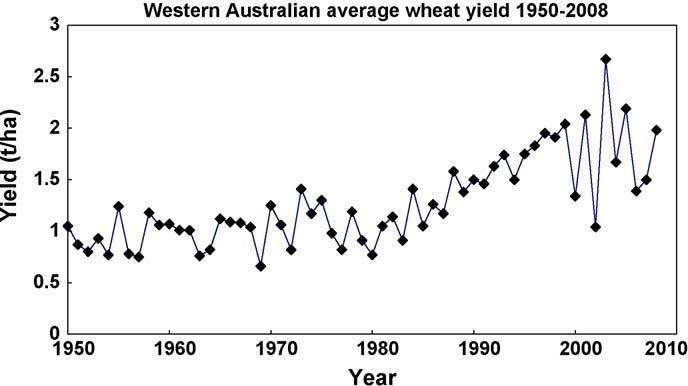 Next PostIs the Australian wheat industry finished?